If you are looking for quality education, safe environment, practical experience along with settlement options; study in Canada is the perfect choice for you. Study in Canada offers you access to qualitative and practical education at a competitive cost structure. Average tuition fee in Canada ranges from CAD 15000 to 20000 which you can pay by semester. Also, you can avail part-time work opportunity to cover up your day to day expense. As an international student, you can opt to study Diploma program, Advanced Diploma program, Bachelors degree, Graduate Diploma, Post-Graduate Diploma or Masters Degree. You can choose from wide range of institutions and programs according to your suitability. Your choice of study program and institution will not cast any impact upon your application; the whole process is transparent and unbiased. So you can choose to study in a Community College, Private College or University. Study in Canada process is fairly simple, all you need is at least second division in your last qualification along with good IELTS score. We at West Highlander strive hard to provide you with full-fledge, fair and transparent information to make your study abroad dream come true. For international student, there are numerous educational institutions and study programs to choose from. Community Colleges are Canadian Government funded institutions offering job oriented practical courses for entry, junior and middle level employment opportunities. These institutions mainly focus on Trade Certificates, Skill Diplomas and similar degrees. They have reasonably priced courses and are result oriented. They work closely with industrial bodies to address to their manpower requirements. If you are looking for a great job outcome without a fancy university tag; Community Colleges are the best bet for you. Study in Canada at a Community College does not require too much bookish knowledge rather practical skill is appreciated. Private Colleges offer low cost high quality education options at Bachelor and Master degree level. These institutions generally offer programs in Hospitality, Business, IT and Accounting as these does not require practical workshops and huge campuses. There fee structure is competitive to Community Colleges rather is at the lower end of the scale in comparison with Universities. Universities in Canada have excellent academic & research facilities. More than 20 Canadian Universities fall among top 500 in the world. University of Toronto, University of British Columbia, McGill University, McMaster University and the University of Alberta have bagged ranking among top 100 in the world. The country is well developed and one of the most sought after learning destinations in the world. The best part is lower crime rate which assures safe and congenial environment for international students to pursue their studies. While studying in Canada, the students can work on part-time basis during the term and on full-time basis during vacations. The multicultural and multilingual community is welcoming towards new entrants. The international students can drive vehicles, provided they own an International Driving License. Depending upon the study program, students can opt for post study work visa of up to 3 years. With the implementation of Student Direct Stream (SDS), all Designated Learning Institutes (DLI) are eligible to accept overseas students, but not all of them provide for post study work visa rights. Students with Skilled occupation or Nomination from the Province can apply for Permanent Residence of Canada. Parwinder Kaur, one of the key personnel at West Highlander is a Canada course graduate (CGC00099). West Highlander is an ICEF accredited agency and has ICEF trained counsellors, possessing experience in overseas study counselling. They impart complete & in-depth information about optimal study options, how to apply to study and prepare for living, tuition fees and cost of living in Canada. Increase your chance of admission success by applying through most qualified and licensed consultant. West Highlander is a leading study abroad consultancy in Chandigarh with more than a decade of experience. Important point If you are a citizen of India but live in another country you cannot apply under this student direct stream (study direct scheme) Colleges and Universities Any college with DLI number (designated learning institute) can support your application for SDS student visa for Canada. You need to fulfil 3 basic requirements of having IELTS 6 in each module, pay one year tuition fee and purchase Guaranteed Income Certificate of $10000. So the student has got wide variety of colleges to choose from which means no longer waiting for intakes. Now the student has got number of options to apply for admission under SDS scheme. If the student has already done his IELTS he can apply in next immediate intake. Getting Canada Student Visa under Student Direct Stream or SDS Scheme Getting student permit to Canada has become quite easy. The documentation requirement is very simple and easy. But it is very important that your consultant for Canada Student Visa does not take your application lightly. Your consultant must guide you properly about application forms and the information required to be filled there. Even small incomplete information may get you Canada visa application under SDS scheme. The offer letter part is very important. The course you are going to study in Canada must be relevant and match your career progression. If these two things are not clear to the visa officer there are high chances that your study visa to Canada may get refused. Why West Highlander At West Highlander we understand that the first step of getting admission in a right and relevant course is very important to get second step of Visa successful. We take care that we counsel the student and suggest them courses as per their present relevancy and level of study. Once this has been successfully done the second step of visa filing with CIC Canada has got good chances of Success. 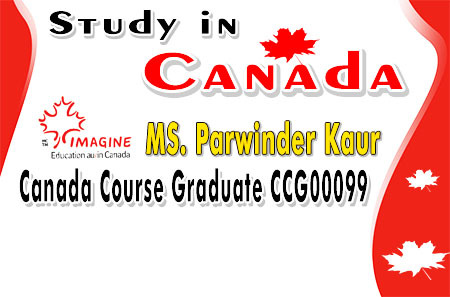 Ms Parwinder Kaur Canada Course Graduate (CGC00099) has years of experience in guiding students about study options as per their profile. The team at West Highlander is well equipped with the knowledge about different course options suiting the applicants thus making their study in Canada admission and visa application a convenient and a smooth process. West Highlander is the best Study in Canada consultant in Chandigarh. The tuition fee for one year study: ranges from CAD$ 18000 – $20000 depending on college & course. Cost of living is about CAD$ 10,000 per year. Your cost of living depends upon where you live and how you choose to live. Students may find that some places are cheaper to live in Canada as compared to others. The general expenses a student has to pay are of accommodation, power, groceries, transport etc. Accommodation: A student may opt for hall of residence, rented house along with friends, home stay depending upon his interest and budget. All foreign students in Canada must have health insurance. Medical coverage available to international students varies from province to province. In provinces where international students are not covered under provincial health care plans, students must arrange for private health insurance coverage. International students who wish to pursue their study in Canada must obtain study visa to Canada. Students wishing to study in Canada should refer to web resources and Canadian embassy website to make sure that they are submitting the required & proper documents with the visa application for study in Canada. The student visa application for study in Canada is submitted at local VFS Canada Application Centre which covers the residential area of the applicant. Please refer to the submission timings to submit your student visa application at VFS Canada Application Centre. The application status of the study in Canada application can the check on the website of VFS global. Canada is ranked No 1 by the OECD for higher education achievement. Canada has continuously ranked in the top 10 courtiers in the quality of life index by the United Nations since 2004. Canada is multicultural; some of the biggest cities have many immigrant communities giving study in Canada rich multicultural experiences. Canada has got one of the strongest economies in the world. General Information session for international students on opportunity to work during their studies on and off campus and there is also co-op work program. For International students interested in learning about immigration pathways we hold general information session and direct to CIC website for complete information. Firm foundation of counseling staff of study in Canada which helps students aspiring to study in Canada understand Canadian education system & its benefits. Complete & in depth information about study option in Canada. Information about how to apply to study, and prepare for living in Canada. Information about tuition fees and cost of living in Canada. West Highlander is a leading study abroad immigration consultant in Chandigarh with many years of experience of study in Canada. The expertise & experience of West highlander team makes your study in Canada dream come true.